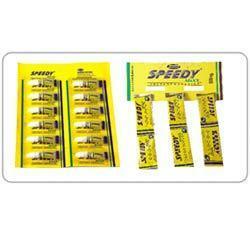 With the aid of our diligent professionals, we are able to prepare and offer Speedy Instant Adhesive. All our products are used to bond variegated industrial and household things such as metals, ceramic, plastic, glass, wood and rubber. The products we offer are provided to the clients in different specifications and packs of varied quantities. Further, these accurately composed epoxies are provided to the clients at economical rates. Offered range of adhesive is acknowledged by the clients owing to attributes such as excellent bonding properties, water resistance and longer life span. 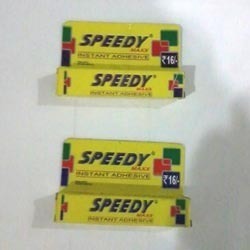 Leveraging on the vast experience of the industry, we are involved in manufacturing and supplying a commendable range of Speedy Instant Adhesive. In order to prepared premium quality products, our professionals use optimum quality ingredient sourced from the trustworthy vendors of the industry. These adhesives are prepared according to the norms and standards already set by the industry. Looking for Speedy Instant Adhesive ?